I'm am thinking about getting a Krytac trident CRB. You can find them around the £300 mark. My question is, are there any better AEGs for the price with out of the box performance? Ive got a CRB. Cant say Im blown away with the range but its a lovely well built rifle. I think Ive had similar performamce from my G&G Top Tech rifles and I enjoy the blowback on them, which of course the CRB doesnt have. Also the stock buffer battery space isnt quite big enough and you can get a lipo in there but its fiddly because the fuse gets in the way. I like the dial up hop and Im using PTS EPM mags which I couldnt before. The flash hider is plastic and had to go. Oh and I like the keymod as its much easier and more comfortable to hold than RIS rails, although I do use a foregrip. Here is a pic before I started using the PTS mags. I have a PDW and an SPR, both have fantastic range and accuracy out the box, I've upgraded the SPR but the PDW is stock and I need a magnified scope to get the best out of it. The PDW can fit an 11.1v LiPo but is stupidly small space. The SPR has the same stock as the CRB and has loads of room for my 11.1v LiPo so am guessing Baz had a very large battery. He has a point re the plastic flash hider.... it is naff and had to go on both mine. I fit a 1450 30C 11.1v Nuprol with 1 down one side and 2 legs down the other, don't use the buffer tube for it. 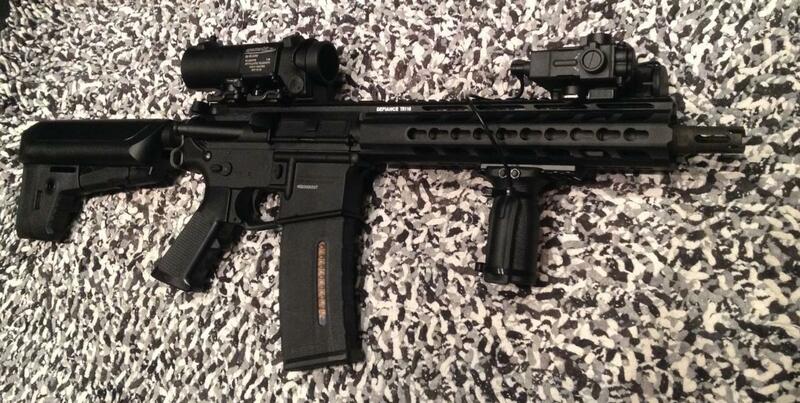 What upgrades have you run on your SPR? Is there much difference between the CRB and SPR internally? Interesting. Got a link ? they must be shorter than my 7.4V one. ETA - sorry Im being lazy. A quick google and your battery is over 10mm shorter than mine. I probably need to get a shorter or split battery and then I can do the same as yours. PDI 6.05 barrel, 30k Krytac motor, Prometheus flat hop, M125 spring, locked to semi. They are identical except for barrel length I believe as is the PDW. Out of interest, what weight ammo are you using ? I found the solution to my battery problem; I fitted a 7.4V 2200mAH brick LIPO in the vertical space at the end of the stock. Fits much easier and has a larger capacity.